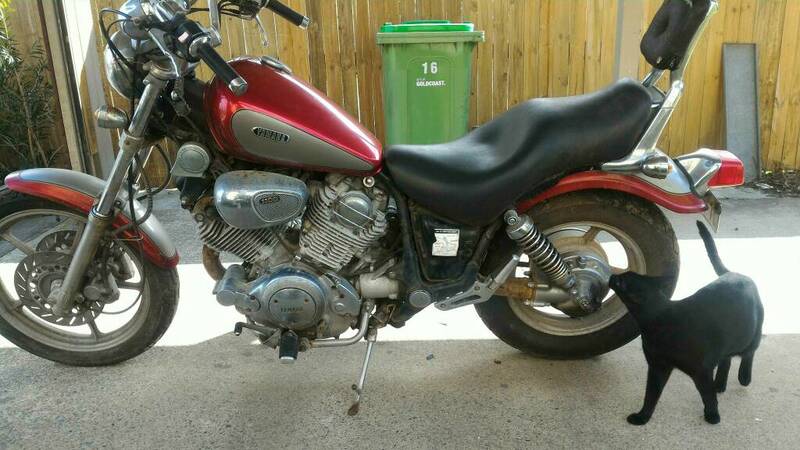 I have recently acquired a '90 XV1100 as a present from my lovely missus. It belonged to my brother in law who had it in storage at his mothers house for the past 10 years. I have found the standard problems with a bike that has sat for so long, gunky carbs, deteriorated rubber and surface rust on flaking paint. My plan is to get her running and reliable again to use as a daily ride, so not much customisation is going to happen. I have already replaced the handle bars with a set of clubmans facing upwards which gives the bike a much nicer feel. Because of this I will have to replace the clutch lever and master cylinder. Spotty has told me about a front brake mod dor the Vmax that may work on the xv. For now I was planning to use the original system as my funds are limited. I have a front tyre in my workshop which will fit but will need to purchase a rear. I was also looking at replacing the dual carb system with a single for easy access and maintenance. Anyone that has worked on an XV1100 will know how much of a pain removing the carbs can be. I am not a fan of chrome so I will be removing most of what I can. My plan is to paint the wheels gloss black when I remove them to replace the tyres. 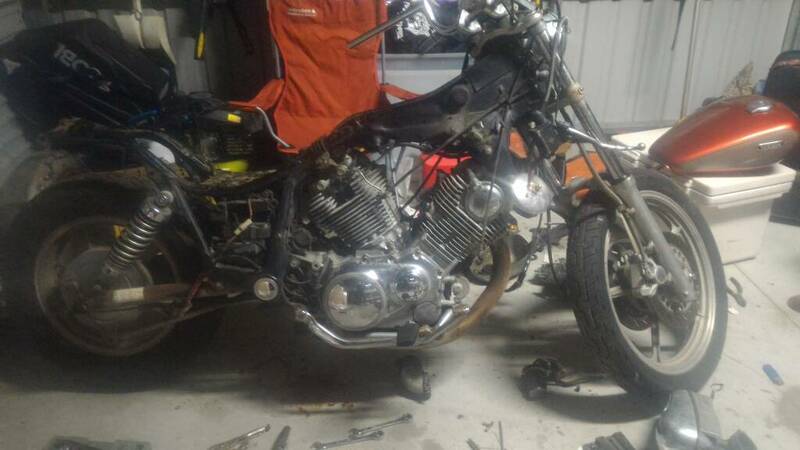 I will also be removing the sissy bar due to the fact that I cannot have a passenger for a year and was planning on putting a rack in its place. Being 6 foot I will also have to remove some foam from the seat so that I can wiggle back a little further. Got a bit of time to work on the bike today. Gave it a bit of a tear down to assess what needs to be done. Most of the electrics appear to be in decent shape. Looks to be un-molested which is a good sign. I pulled the exhaust system off as well. It has a 2 to 2 system which looks like it was made for the bike. I have removed that and plan on using the upper pipe on another bike. A friend has given me his old exhaust system which I am planning on using. It is off a M109R and is a 2 to 1 system. I need to order new indicators, tail light, levers and fuel/vacuum lines. These will most likely be ebay specials as I am trying to keep cost down. I am still considering replacing the bulky carb system with a single carb intake. This will clean the bike up a bit. The front fender has a lot of faded paint and has also rusted through in a few spots. Not sure if I should just replace it or respray. Budget will dictate but more than likely a respray. I am planning to paint most of the parts gloss black, I will be keeping the tank the original colours as it is still in good condition. I will be using red accents on the bike such as fuel lines, grips, horns, levers and such. Hopefully it does not look to tacky. Ordered a few parts, waiting for them to arrive. I dropped the oil in the engine and final drive. Both were black as diesel oil and both plugs had small bits of metal on them. Looks like I have a few oil changes ahead of me to get her clean again. Not sure what to do for the paint yet. I was thinking of respraying the silver parts black. Considering getting shorter rear shocks as well. I'm along for the ride. I have ordered a few aftermarket lights to replace the stock units which should arrive in a few weeks. Spotty. I would be interested in those brackets. I am wondering if they will work due to the virago being leading forks. I will measure the bolt space distance once I am home and post up on that. I have a set of 295mm shocks I was going to try on her and see how she's goes. Ultimately I would like RAMSHOX virago units built for my weight but due to funds that will be a long way off. I shall have a look for them, since we moved everything is hidden under the house but they are there somewhere. Pulled the rear wheel off today. Going to give it a sand blast and a few coats of epoxy gloss black. Got a price for a new rear tyre, $190 fitted.